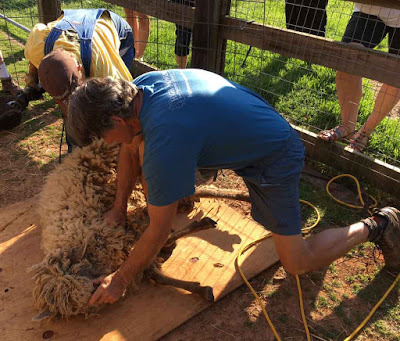 I had the opportunity, on Easter Sunday, of witnessing a sheep shearing at the farm of our friends Phil and Mary Busman. Time at Cherith Farms is always beautiful and fascinating: colorful chickens (and eggs), rabbits, abundant vegetables grown for the CSA. . . it is always fun to see what's growing and check in with the animals. On this day there were lots of baby rabbits and an adorable young lamb to admire. Four adult Tunis sheep were to be sheared, two ewes and two rams. (You can find out more about the Tunis breed HERE.) I was especially curious about the shearing process as I had recently spoken with a tapestry weaver whom I respect a great deal. 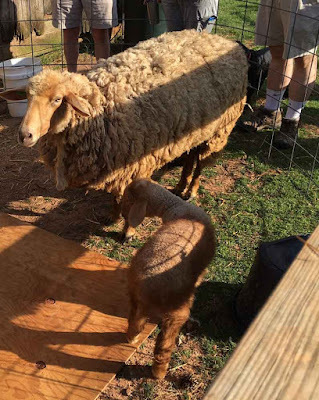 She has decided to shift away from using wool toward other fibers in her weaving, out of concern for what she sees as cruelty in the shearing process. A Google search reveals that there is ample documentation for recent instances of horrifying and needlessly cruel and abusive treatment by sheep shearers in Australia. PETA also says it has documented instances of abuse in the US though I could not find this documentation on their website, which focuses on Australian practices. (Let me know if you find this documentation.) The instances in Australia are indeed appalling, and reform of those practices is desperately overdue. 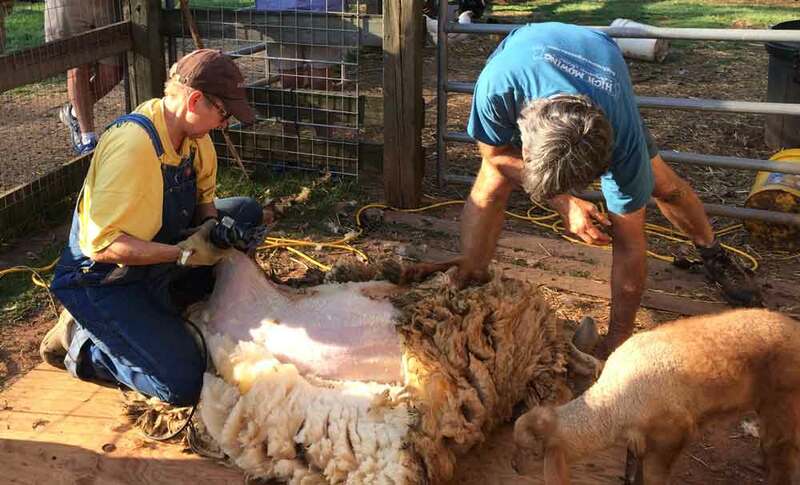 Indeed, several shearers have been prosecuted. 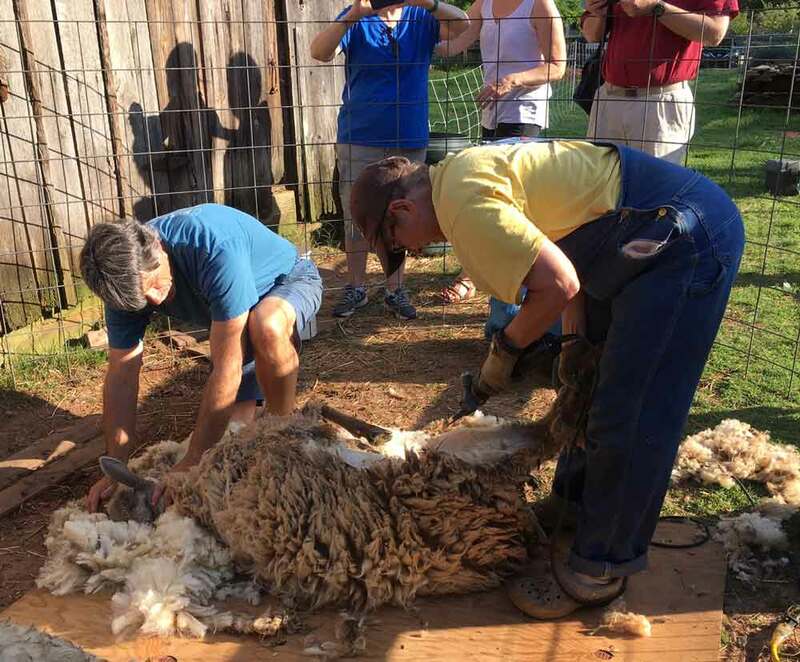 Our shearer was Rosemarie Szostak, who has been shearing sheep in the Southeast US for 30 years. 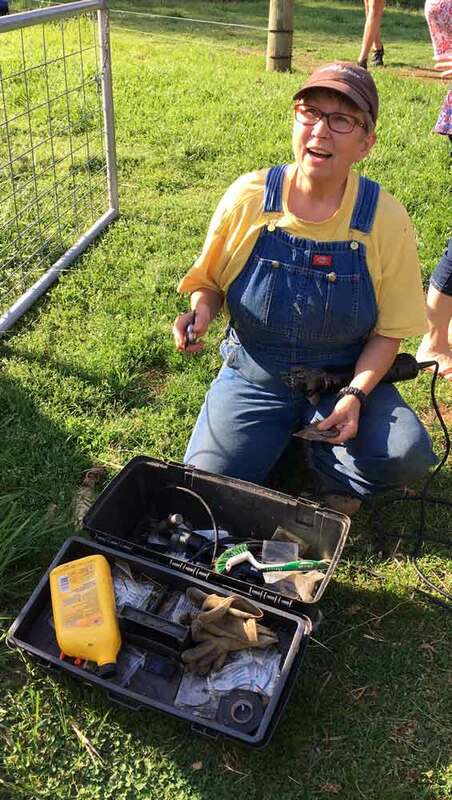 Usually her husband assists but this time Farmer Phil was helping. Rosemarie spoke a bit about how she got into shearing. 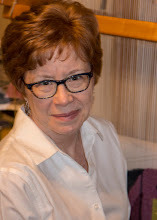 She was a knitter and spinner and decided she wanted to make a sweater "from scratch." 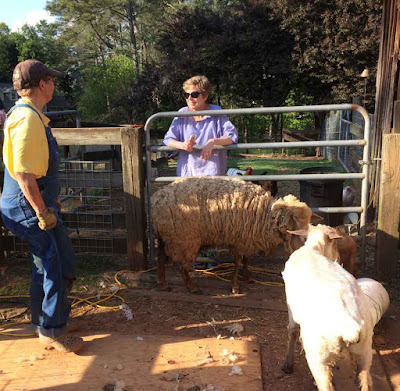 So she raised the sheep (Gulf Coast), took a shearing class. . . and fell in love with shearing. She says she never did get around to making that sweater. She now has 300 fleeces in her stash. Rosemarie was trained in the Australian method, but she said that those guys rely on brawn. Since most sheep outweigh her, she uses what she called the G-method (G for "girls") that relies on brains instead. Before she began she changed to clean blades in her electric shearers, to prevent the spread of lice and for added safety all around. She instructed Phil to hold down each sheep's head as she worked, but not their legs, as that would make them more likely to kick and flail. As we watched, each sheep did kick a few times, but mostly submitted to shearing without much resistance. I was reminded of how toddlers are frightened when they get their first haircut. Rosemarie and Phil begin to shear the first ewe. Yes, there were a couple nicks here and there, but nothing serious. They seemed to me analogous to the superficial nicks one might get while shaving. Rosemarie admitted that she had, in her several decades of shearing, accidentally injured two sheep a bit more seriously. So, yes, injuries are possible. But it would seem that it would be to the shearer's and the farmer's advantage that such instances are kept to an absolute minimum. Sheep are valuable livestock. Clumsy shearers are not invited back. Shocking how white the skin and wool are under the dirty top layer! I'm chatting with Rosemarie. One sheep is shorn and another is waiting. Like many fiber artists, I am increasingly concerned about the sustainability of the fibers I weave with, the impact of their cultivation on the land, the water, and the people who process them. This is a huge and complicated topic, too much to consider in depth in this post. I had always thought that wool was among the most sustainable of fibers; certainly less harmful than polyester (made from petroleum) or cotton (when conventionally grown, it is terribly water- and pesticide-dependent). Linen is good but hard to grow in the US, I understand. When I was weaving scarves and shawls I favored Tencel for its sheen and drape, but also because, when properly manufactured, it is made from sustainably grown plant pulp in a closed-loop process with minimal environmental impact. But it too is mostly produced overseas. It's actually surprisingly difficult to really know where and how the fibers we buy and use are made; believe me, I've tried. There's a lot of confusing and conflicting information. One answer may lie in the growing movement toward using fibers from one's local "fiber shed." Phil and Mary used to send their fleeces to a mill on Prince Edward Island in Canada to be processed, spun and woven into blankets (we are the lucky recipients of one of these) but they are excited to have recently found a Georgia processor who can do this. Our neighbors in Western North Carolina are among those in the Southeast promoting the development and use of "local cloth." I look forward to learning more about this. Meanwhile, I'm going to continue to buy and use wool, at least for awhile, with a preference for wool from small US-based producers. Please chime in with your own information and perspectives on sustainable fibers.